Love this method. I was doing something similar – I think I heard about this program on an NSD chat here at GS actually. My challenge is when designers don’t label the file names within the zip files. Most include their name and kit name or at least abbreviations. 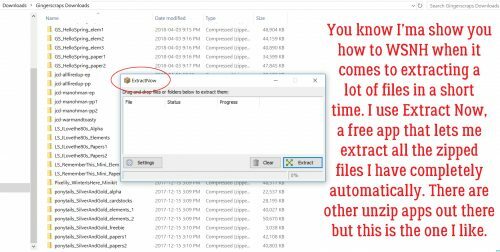 However some don’t and so when I unload 2 or 3 (okay more) from same designer all files labeled PP or CP go into the same folder. Then I need to go into each of those folders and resort. Learned that the hard way. OMG! That is fantastic! Thank you for sharing it with us. I just cleaned out my download files of 6 kits purchased April 1 and 4 others from March! Will not be procrastinating on NSD! OMG!!!!!!!!!!!! Extract Now is amazing! Seriously had no idea there was an app like this! Cut down my unzipping time to almost nothing. Got my entire download folder opened this weekend. Almost all of it sorted to where it needed to go with your ideas about how to set the destination. Thank YOU!!! ps. teamkobza, I agree! SO frustrating when designers don’t go to the trouble of labeling/naming their folders. I sorta know the ones, so I open those file groups separately. Lori, that’s where I heard about it too. I don’t remember who was using it, but somebody in the chatroom (I miss it!!) mentioned it. It’s a-MAZING! It’s such a time saver! I used to have the same trouble with the subfolders not having the kit name on them, as you describe. 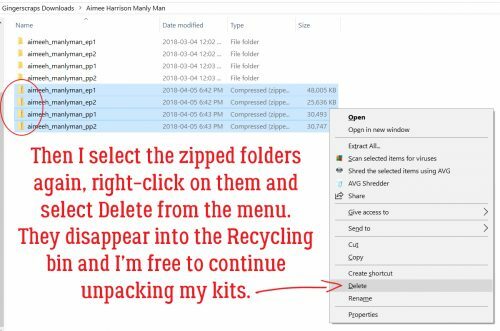 That’s when I decided I’d just move all the kit’s zip files into a new folder with the designer and kit name spelled out in full, and I wouldn’t have to worry about it any more. Jan, thanks for the info on this app. If it doesn’t come with my computer, I’m afraid to download these extras unless I know they are safe to use. I like knowing that someone has actually used it & has had success with it. Although, I have been keeping up with the daily downloads, sometimes when I’ve bought a collection or bundle, I put off unzipping because there are so many files. This will be a great time saver! Thank you! I’ve been burned a few times with apps and freeware, so I’m extra-careful these days. I would never recommend anything that’s going to put your computer at risk; I’ve used Extract Now for several years with no issues. OMG Thank you thank you thank you!!! 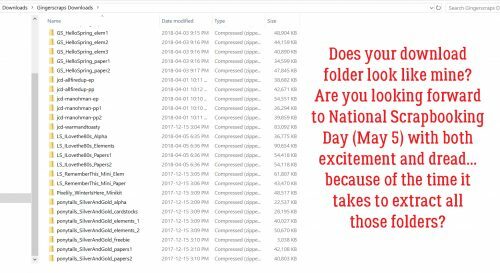 I have so many not unzipped files .. I can wait to try this!! I am super excited .. this would have to be the best tip ever, lol. Woops, that is supposed to read “I can’t wait to try this” .. brain is not working well at this early hour of the morning! !